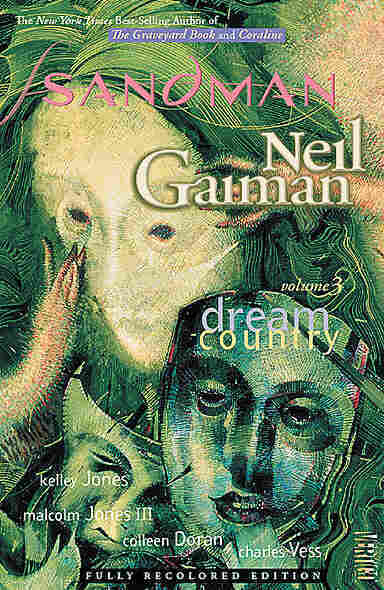 Book Club: Neil Gaiman's 'The Sandman: Dream Country,' Part Three This week, our book club discussion turns to "A Midsummer Night's Dream," as told in the graphic novel The Sandman. If you thought a play within a play was something, check out the whole thing as part of a larger story about dreaming and writing. So this is the story where we are getting most heavily into the idea of stories and dreams, to me. (I mean so far, in this book.) I have to admit that at first, I thought there was a little bit of a possible too-cute-for-its-own-good problem, in that it's already a play within a play, and now it's a play within a play within a larger story? It's a little Russian-nesting-dolls for me in principle, but I found that I adjusted. And one of the reasons I adjusted was that I had no trouble at all distinguishing between the levels of reality because of the way the art is done — both because of the use of blue to signify the ... dream world, or whatever, the world of the spookypants business going on with the actual real faerie types, and because of the way the art depicting the play is ... hmm. I'd say the art is more ... straightforward? Less whimsical? When they're performing the play and you're basically just seeing a depiction of the Shakespeare, I'd call the art more narrative and less atmospheric, if that makes sense. So I expected to be confused, but I mostly wasn't. I really enjoyed it, even though I wasn't sure I picked up every nuance, since I haven't studied much Shakespeare since high school. (Sad, but true.) This is also where I admit that whenever I read the closing Puck speech, I always think about Dead Poets Society, where that's the last thing Robert Sean Leonard does before he goes home and ... well, you know. Well, technically the term is "spookybreeches" or "spookytights". But, yes. Yeah, the art's much different — gone are Kelley Jones' heavy shadows and murk, replaced by Vess's lighter lines, airiness and twinkly bits of Faerie whatsit. And yes, Gaiman asked Vess to pull off a very difficult job — keeping the reader oriented through layers of narrative that make Inception look like Hop on Pop — and I'm glad you didn't get lost. I've met several folks over the years who had trouble following the action, but in most cases that was a result of what we've discussed before: the impulse of prose-oriented folks to simply hurl themselves from word-balloon to word-balloon without looking down, like they're running the Wipeout! gauntlet. Of course, lots and lots of non-comics-readers have been handed this particular story by their comics-reading significant others, over the years. Coupla reasons for that: It was the first (and to date, only) comic to win a World Fantasy Award, which made quite a splash back in 1991. Also it's about Shakespeare. And here's where I confess my ambivalence, not to the story itself, which is aces, but to a certain latent snootiness you can still hear among self-styled 'literary' types who'll give a comic a chance, but only grudgingly, and only if it's about something they deem worthy. "THIS comic is DIFFERENT. It's LITERATURE. It's about SHAKESPEARE." (See also: "The only time I regret not owning a television is when I hear IFC's showing a 12-hour documentary about the history of snoods.") But that's a me thing. I'll get over it. The "stories don't have to be real to be true" thing is another major theme, of course, and I like how the denizens of Faerie are all about gloss and glamour — making something real look different/more enticing is their standard operating procedure, after all — yet they can't get their heads around the human act of making up stories. And I like the fact that Shakespeare's deal with Dream is measurably less twisted and abusive than Madoc's deal with Calliope. Also: Dead Poets Society is a treacly sap-fest of insufferable preciousness which attempts to push emotional buttons with its giant ham-fists.